It almost kills me to say that because we really didn't need a new car but at the same time we did. We definitely didn't need the car payment that we now have but there's not a lot that I can do about that now except figure out how to pay it off as quickly as possible which will definitely be happening. So when we bought the Equinox which is the car I currently drive, we decided that the next car we would buy would be for Rob. It only made sense because now his car was the oldest and I got the last new one. But since his Impala was in great shape, we also knew that wasn't going to be happening any time soon. Fast forward about seven years and finding out that we actually got pregnant again and would be adding a third kid into the mix. I started worrying that the Equinox wasn't going to cut it. 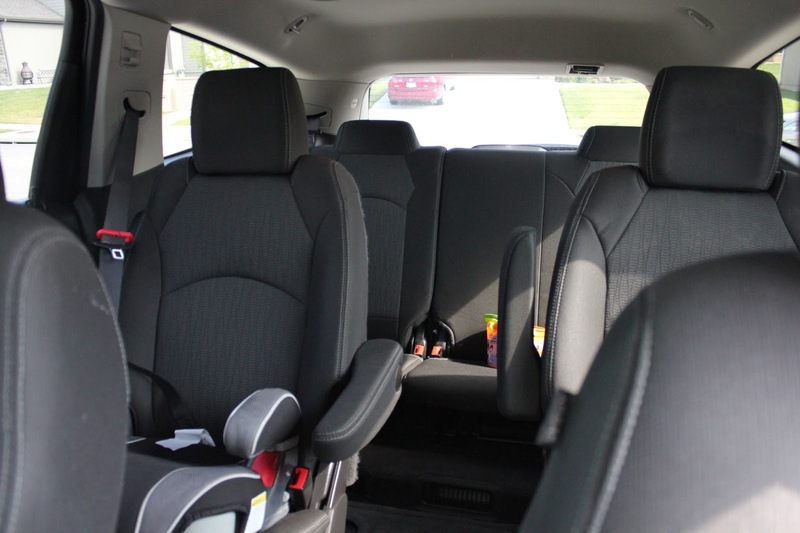 I spent way more time than I should have looking online to figure out if it was possible to fit three carseats across in the Equinox. We would have a booster for Addison, a regular carseat with a five point harness for Connor and an infant carseat for jellybean. I had already tried putting the infant seat in and found that the only way to fit all three was meant actually hitting the carseats with the doors when I closed it. I knew that wasn't a good plan or safe. 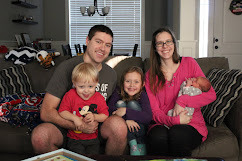 After researching online I found the only way we could possibly do it was to buy brand new carseats for all our kids which wasn't high on our list since all their carseats were in good condition and even new (Connor's we got for him as a forever seat and it was fairly expensive). That of course left us with the option to then buy a new car which of course is even more expensive than buying new carseats but in the long run would we really be upset about having more room and not having the kids sitting right on top of each other? So we started looking. 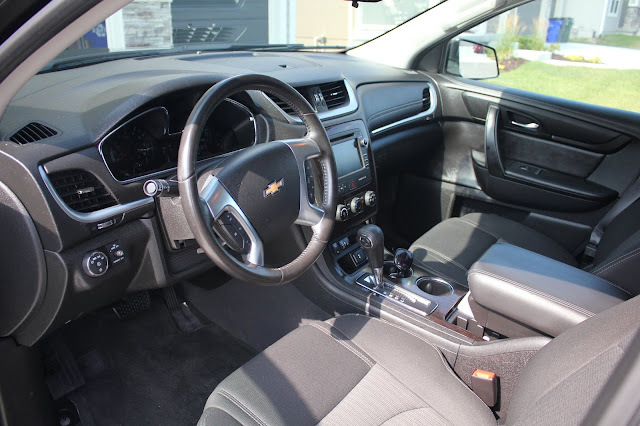 We naturally starting looking with Chevy since that's what both of our cars are currently and we love them both and quickly found the next step up was the Traverse. Chevy doesn't actually have a mini van but this is their version of it. So that's where we landed. We spent a long time looking at the Traverses trying to figure out if it would suit our needs. But we delayed making a move on it until after I was into my second trimester since I continued to worry that with my past something would go wrong. It seems that every weekend we would spend time on the Chevy website looking at their used inventory to find cars and by the next weekend those same cars would be long gone. My anxiety was starting to grow that we wouldn't find what we needed.Our biggest thing was definitely that we needed the captain's chairs in the middle row so that Addison would be able to easily get to the backseat since laying out seats with two big carseats attached to them wasn't going to be possible. I also prefer a dark color for the vehicle just out of personal preference. We were looking for long mileage on it without it being new and if it had the perks of a DVD player we weren't going to turn it out. We were also looking for leather seats. We had debated on this topic for a long time but leather seats were just so much easier to clean and ultimately decided that was an important feature for us. One random Saturday Rob and I were talking about cars again and I was expressing my concerns once again that we wouldn't find the right thing when we decided it was time to just make the move. We had the money in our account for a downpayment - thanks to some of the profit from selling our old house (which also felt like a knife to the gut because I was saving that for us to finish our basement but this was a necessity so it was what it was). We just had to clean out Rob's car which was the one we decided to sell since it was older and had a few more problems than the Equinox and in the long run although we could have gotten for more for the Equinox it was better to keep it. So we headed to the dealership. Addison took one last ride with daddy in his car - she was a bit upset about selling daddy's car - while Connor and I meant them at the dealership. And we started the search. First we looked at the car they had there which was a white and not leather and a few more miles than we wanted on it, but at least it would give us an idea that it was the right size and fit for what we needed. The kids loved it, climbing in and out and all around. We decided quickly the Traverse was definitely what we were looking for. 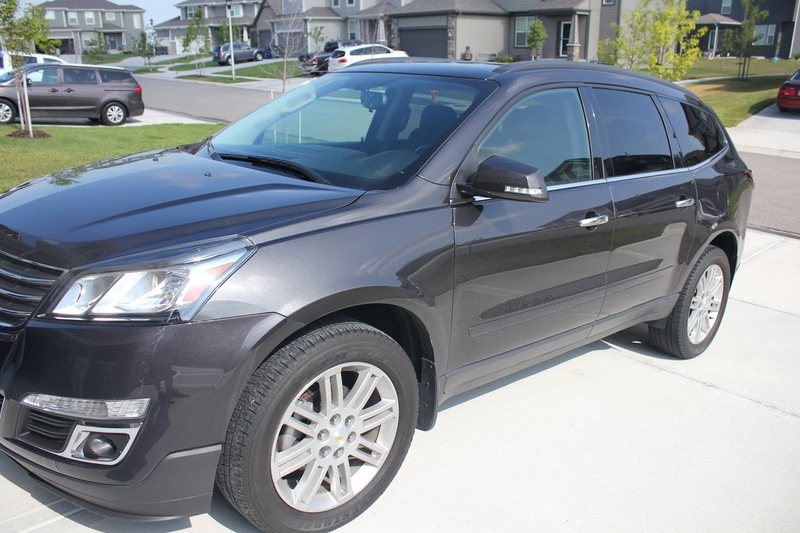 It was basically just the bigger version of the Equinox which was perfect since I was upset about not driving my Equinox anymore because I just loved it so much. We headed back inside to talk with the salesman about what we were looking for. At first he told us would have to go to the other dealership to look at the car we were hoping to buy because they didn't transfer cars but then he discovered they did do that now (which they did for us with the Equinox way back in 2011) so they could sell it to us. The only problem was that it didn't have the leather seats but they said we could have them put in - done! So we started the paperwork on a 2015 30,000 mile black Traverse. We were given pricing and payment costs. We started signing paperwork. Then a manager came over. Turns out once they got ahold of the other dealership, they found out that that very car that been sold earlier that day. He gave us a few options for what they had there. They had a 2018 Acardia there which was the same footprint or a Traverse they just got and was being cleaned and detailed. They would do their best to make the deals the same to help get us into it. We went to look at the two cars. First we discovered the Acardia, although it was nice, was actually a bit smaller and there was just something I didn't like about it so that took that one off the list. Then we looked at the Traverse, it seemed okay until I noticed it didn't have the captain's chairs in the middle so that ruled that one out. I was starting to feel like I was being picky but they said they would continue to look. Sure enough they came over and told us they found another 2015 dark Traverse with 36,000 miles on it at the other dealership and it was still there. They would do the same pricing as before. We were golden. We started resigning papers and moved forward quickly with that one. All in all the whole process took about 3 hours which wasn't bad if you aren't an antsy 2 year old, but truthfully Connor did really well. Addison has always been our more patient kid, plus with age she did well. Connor lost it near the end when we were trying to sign financial papers but once I was done signing things I took the kids and we headed off to dinner. It did meant I didn't even really get to look at the new car until after Rob got home with it but it was ours and it was done. We had officially made the trade from the Impala to the Traverse, adding in a car payment but also the room we needed for the new baby. And it turns out that although Addison was really upset about us selling Rob's car, she loves the new one and forgives us for doing so. We split between the two cars right now with Rob mostly driving the Traverse until the new baby comes and the kids and I sticking with the Equinox. It's definitely nice, but a lot like driving the Equinox, just a little wider and longer. I think it is definitely the right fit for us going forward and I'm even more excited that that is one thing we can check off our list of things to take care of before this baby comes.